Everything happens for a reason. Learn something new every day. Schemmer's Jason Teel, Senior Materials Testing and Special Inspections Manager, carries these as his guidelines in life. He and his wife of 12 years instill these values in their two daughters, ages 10 and eight, while coaching them in whatever sports interest them. Since joining Schemmer five years ago, Jason has been discovering and solving problems that may arise in the field prior to and during construction. Ensuring his clients are happy is his biggest motivation, and his outgoing, approachable demeanor and can-do attitude help him achieve this on a daily basis. “Our availability, organization and technically trained personnel, who get the job done efficiently, are what sets Schemmer apart from our competitors,” says Jason. 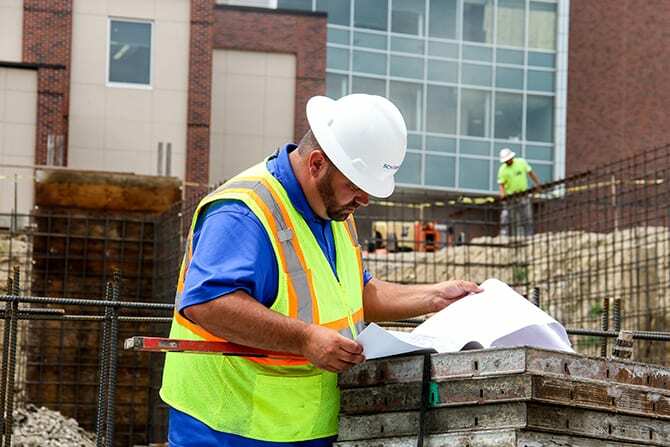 He and his team administer construction materials testing and special inspections across all of Schemmer's markets. From roads to buildings, they provide testing that can reveal issues related to quality, highlight future risks and assist with engineering decisions. This testing can help avoid expensive repair or renovation work to correct faults and reduce risks to other people and property. The recent flooding in Nebraska has been devastating in many areas. As a result, Schemmer has been awarded a repair project at the entrance into Two Rivers State Recreation Area at 264th and F Streets, which is currently closed. Jason is excited to start work on this project as it is another opportunity to learn something new. "You can't believe how powerful the water is until you see it. It's so destructive," he says. Jason's favorite aspect of materials testing and special inspections is being able to do something different every day. This is especially true on roadway projects. "When you design a building, you pretty much know what you will be getting ... they tell you how to build it and you're going to build it. But roads are always different from what the plan is. It may look good on paper but something is always different and you get to figure out any problems in the field." To learn more about Schemmer’s Field Services Market Click Here.